On Saturday morning, Jay, Matt, Marissa and I drove south of Madison to Paoli, where we visited the specialty shop Cluck the Chicken Store. 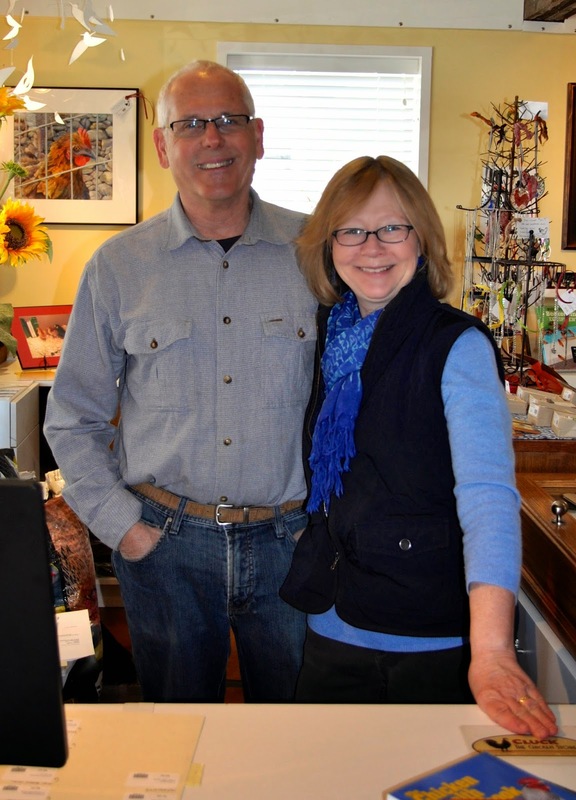 We were immediately greeted by the owner, Susan Troller. I felt immediately at home, and Susan's enthusiasm for our project was contagious. When she learned that the four of us were doing a next door neighbor chicken co-parenting thing, she got particularly jazzed up about our project. 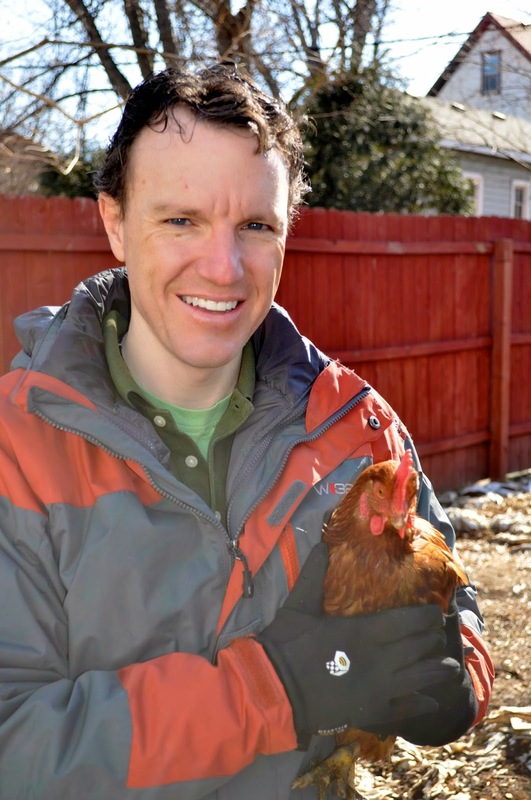 "I think one of the best things to build community in a neighborhood is people sharing chickens like you are," she said to us. The front half of the store is a wonderful collection of all things chicken – if you can think it, she's got it with a chicken printed on it. Plates, napkins, stuffed animals, candles, silly magnets – you get the picture. She also had some wonderful books, Jay and I bought two, and Matt and Marissa bought one. I imagine there will be a lot of sharing across our driveway :-) I'll write more about the books as I read them. The back half of the store is where it gets a bit more practical – large and small bags of feed, watering systems, vet supplies, etc. But one of our big reasons to take this field trip, was to see their chicken coops outside next to the store. Susan was very happy to show us around, and was particularly excited because today was the first day the outdoor displays were open to visit. Almost immediately after she started showing us around, she was needed in the store, and her husband (whose name I simply cannot remember, I'm sorry about that) stepped outside to show us his latest coop designs. In the 20 minutes we spent talking with him, I learned a great deal about what to do, and what not to do as we design our chicken coop. This coop has it all. Easy access to remove eggs and manure, very safe and predator proof, lots of ventilation and even a cubby for electrical connections so they're protected from the weather and curious chickens. Finally, Paoli itself is a real treat. In the span of two blocks, there is a lovely antique store and an art gallery in an old grist mill, which in itself is a spectacular sight. There's a teeny cheese shop and the smallest café with a chef with the biggest heart. You really have to check out the Paoli Bread and Brat Haus. It's true, I'm turning into a "crazy chicken person." To that I can only reply, "Why haven't I known about how fun chickens are before?" Spotted at the March meeting of the Madison Area Permaculture Guild. As I've said in a previous blog post, there are some good things about winter. But even the optimist in me gets down when the first day of spring brings 30-degree weather, and I hear that northern Wisconsin is getting up to a foot of snow. That's when I go into my basement. Peel back the cardboard reflectors. And gaze upon the greenery. 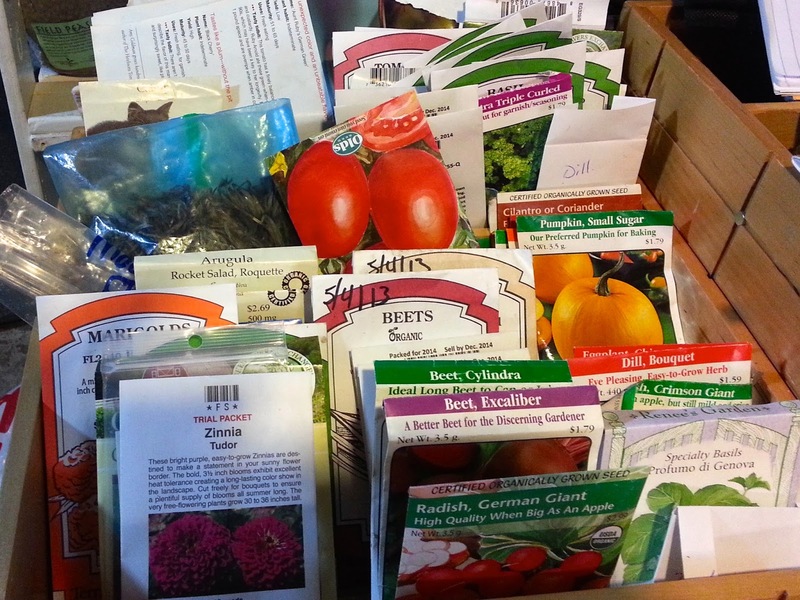 I like to start seeds. It gives me something to do deep in the winter when the satisfaction of having planted tulips in the fall wanes. But mostly, it's to get something green green in my winter life. To add something living. And what offers the hope of spring more than putting a seed in dirt and within a week, something green pushes out of the soil? My grow table with lights, seed mats, home made reflectors and leftover foam insulation. In a corner of the basement, I built a table on which I have some 1" foam left over from another project. 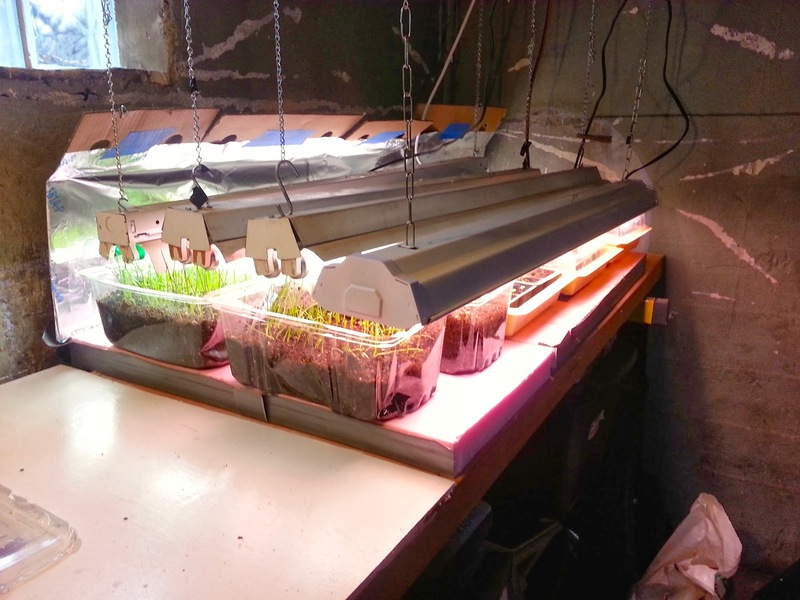 I put some heavy duty aluminum foil on a large piece of cardboard to keep every photon of light in where the seedlings can use them. Overhead, I have four 2-bulb shop lights with normal fluorescent tubes. I did splurge and three of the eight bulbs are special "grow" lights. Seeds like tomatoes and peppers like it warm. 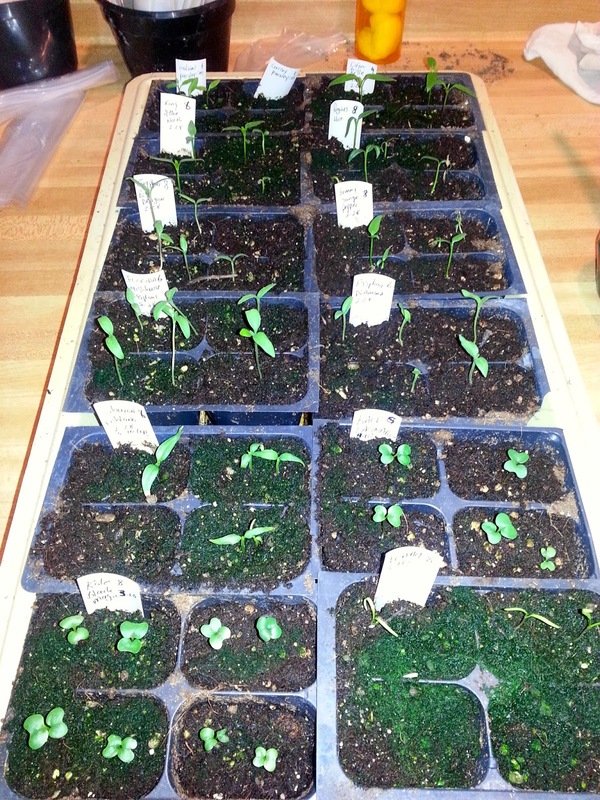 I use seedling mats under the trays. I think the foam helps maintain the warmth, and enclosing it in the foil/cardboard reflectors can't hurt maintain a microclimate in my otherwise cool basement. The photo at right is my pepper and tomato collection. 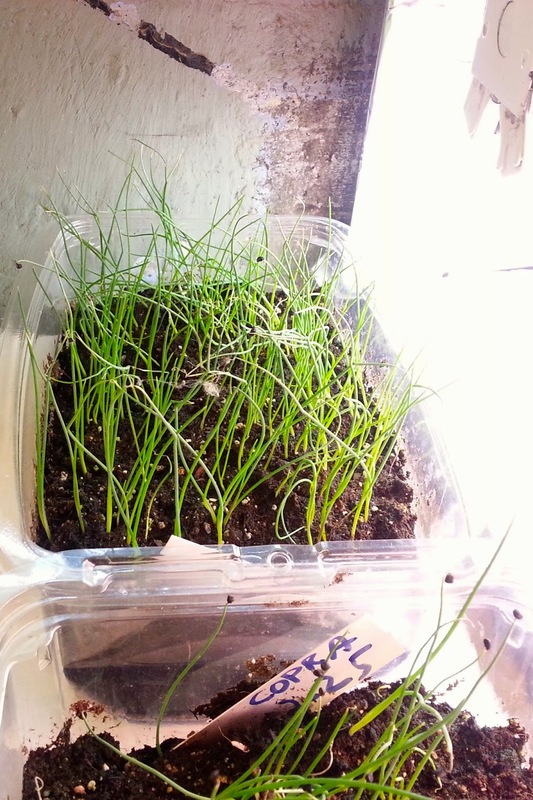 Now that they have sprouted, I took the clear plastic dome off so they can get some air. Yes, in the lower right that's some moss growing. This generally isn't a problem. Despite the Wisconsin weather forecast for a cold and rainy weekend, there are a few obvious signs of spring. The first is that Friday evening, I walked eight blocks to a dinner party! A winter walk any distance further than my car to the garage alone is noteworthy. Here's a few more things I saw during my evening walk. 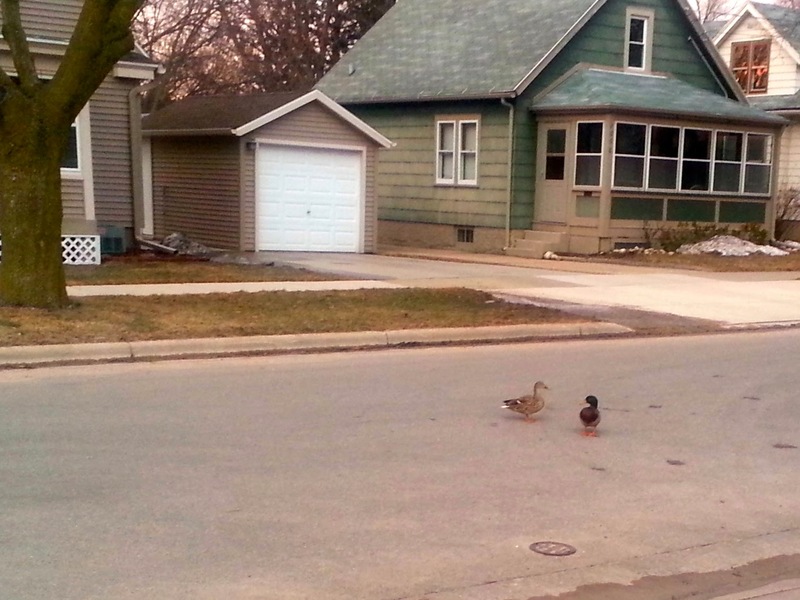 On my way I saw a pair of ducks waddling in the street. 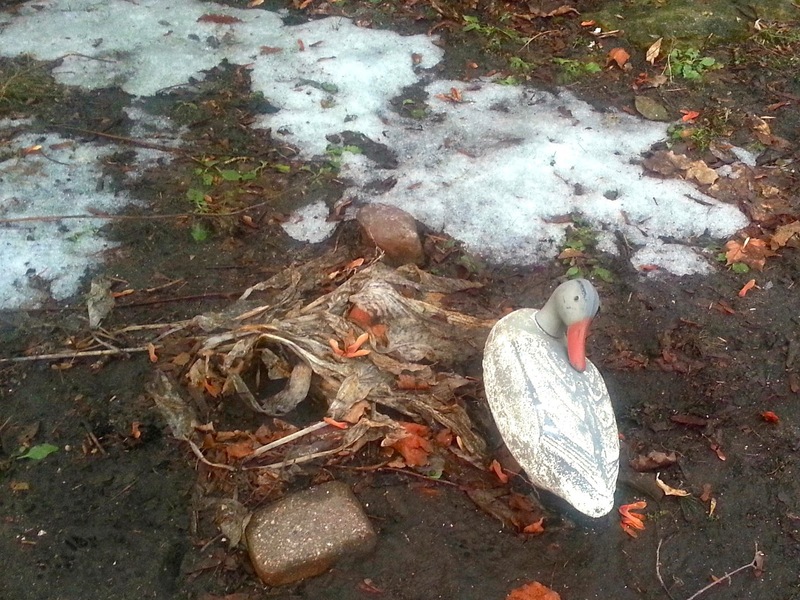 I also found this duck (decoy) though I'm not sure what its purpose was in someone's front lawn. 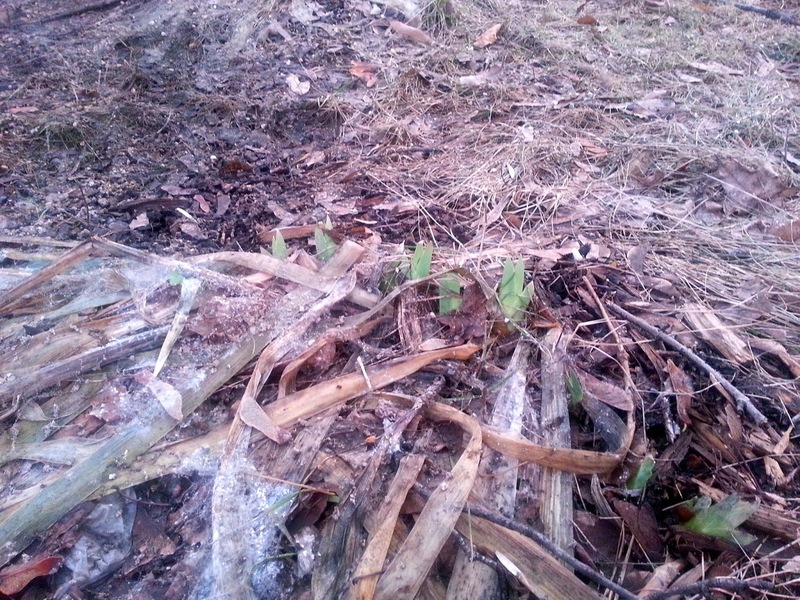 I found something poking up through last year's debris, perhaps irises? At this point something else occurred that I found happens much more often during nice weather. I stopped to talk to people! Why don't have a photo of them, we had a lovely chat and they pointed out that their tulips next to their home already had 2 inches of greenery above the ground. 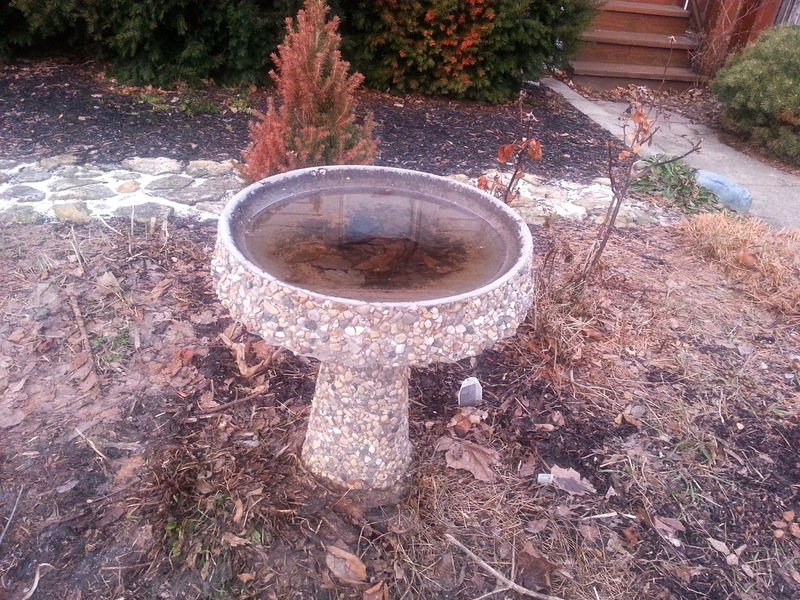 A birdbath waiting patiently for someone migrating from the South to return. 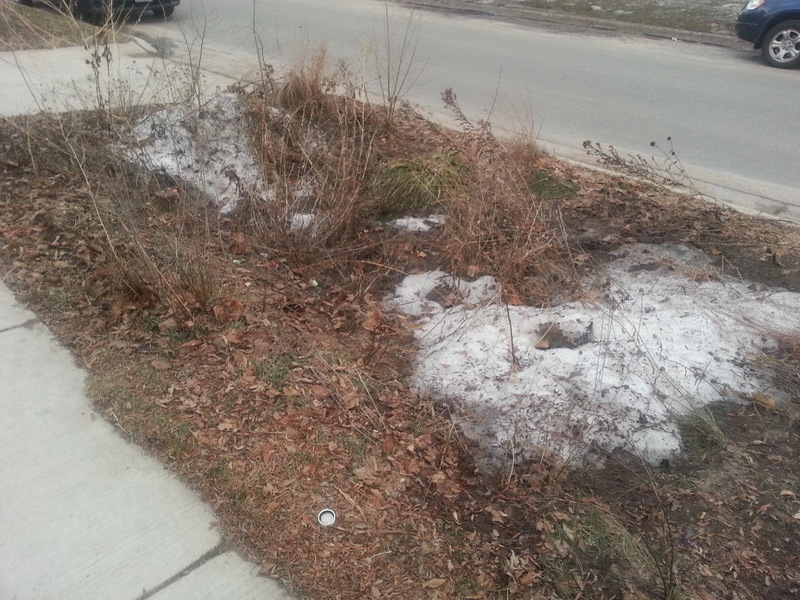 A rain garden waiting patiently for the snow to melt and rain to arrive. 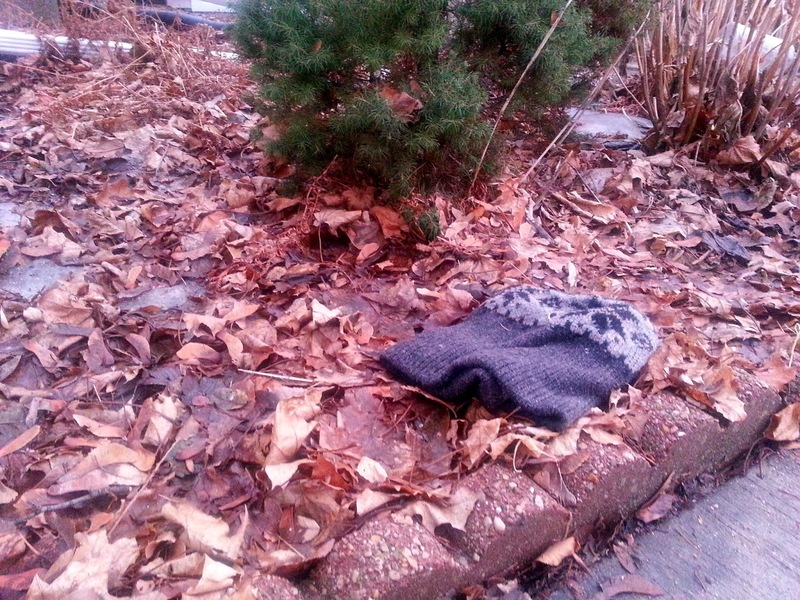 One of many lost winter items that soon will no longer be missed. As long as I can recall, I haven’t been winter’s biggest fan. As a kid on a working farm, when I carried water to animals through snow as tall as I was uphill both ways, winter felt like an endless and brutal season. When I was 10, I made a deal with Mother Nature; I was allowed to curse the cold, the snow and the ice, but I could never once complain about the summer heat. I’ve stuck to my word for 32 years. I’ve now had three decades to reconsider my relationship with winter, and this winter in particular seems like a great time to write it down. Spring, summer and harvest season (I don’t use the “f” word in my house) are a riot of planning, planting, picking, pickling and putting by food from my garden. Some people say that folks in the north cram nine months of activity into our three-month summer. 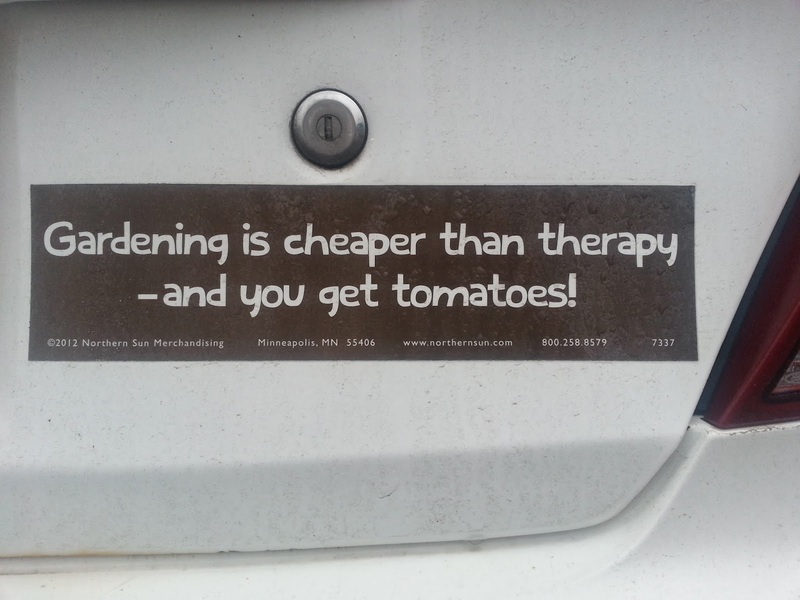 That may be true, but if we had a nine-month growing season, I’d be working in my garden the whole time. So maybe winter is a mandatory rest period I wouldn’t otherwise take. I like the change of pace winter brings. I also like some of the other changes that happen at our house. Our menu changes as we incorporate more frozen and canned food. I love nothing more than going into the basement in the middle of winter and bringing up garlic, onions, cans of vegetables or fruit jam. We play more games with friends. We watch more movies. We go to plays and all the fund-raising dinners we attend seem to be in the winter months. We don’t make time for these things in the summer, so I’m glad winter makes time for them for us. Another thing winter does is it slows me down. I’m a “doer,” meaning sometimes I stick a shovel in the soil and start digging, occasionally a little sooner or in a different place than had I planned in advance. So winter’s forced “down time” from the garden helps me sit back and observe my surroundings. It gives me time to reflect on the summer past and the summer to come. It’s also when I get my graph paper and doodle garden beds, pore through seed and plant catalogs and read the magazines I didn’t read when they arrived last summer. Finally, this winter’s “polar vortex” was particularly long and harsh, but this isn’t new. Every winter has a spell of below-zero weather. I have a name for that bitter cold. I call it “bug-killing weather,” and I like to think it’s the reason we don’t have cockroaches the size of my foot or malaria mosquitoes here in Wisconsin. So on reflection, I’ll continue to curse the cold of winter (and relish the heat of summer) but maybe, just maybe, winter isn’t all that bad – and even has it’s purpose in my life. When I started chicken sitting four weeks ago, only one chicken was laying, and sporadically at best. Today, I found a site worthy of a bit of excitement! 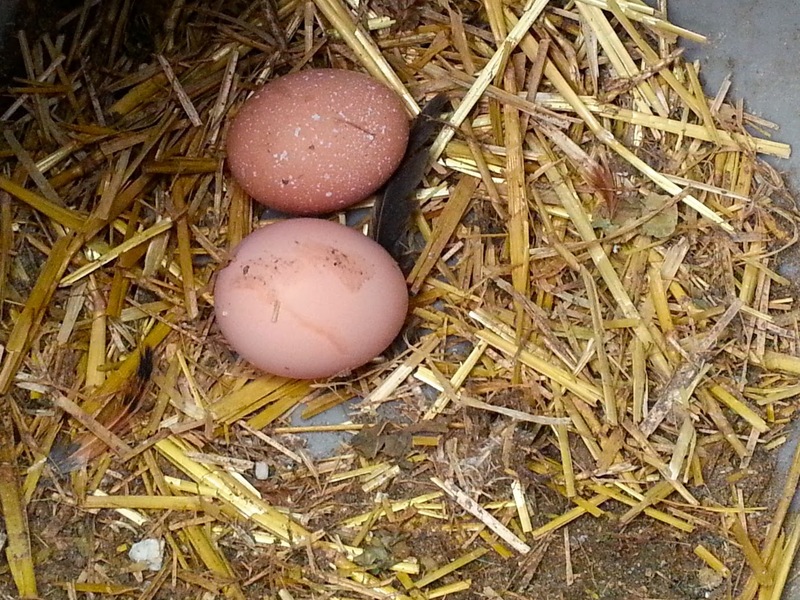 Not only was I delighted to find two eggs, I've decided with no scientific backing whatsoever that the chickens have decided it's spring and that's why another one has decided to start to lay. When I was little we raised chickens on our family farm. I remember the large coop that was already on the property when my folks bought the farm. It was leaning a bit to one side and drafty, but it wasn't far from the house so it was easy for my brothers and I to feed and water the birds, and gather eggs. The actual animal health care, diagnosis and treatment of illness was left to my parents. And I suspect that for a sick chicken, the likely cure was euthanasia. It's hard to justify an expensive vet bill for a $5 animal. But back to the joys of taking on a new project (like raising chickens), I like the challenge of learning all about a new subject. I took three 1-hour classes on chickens at this year's Wisconsin Garden Expo, but none of them prepared me for what I found in the nesting box this weekend. 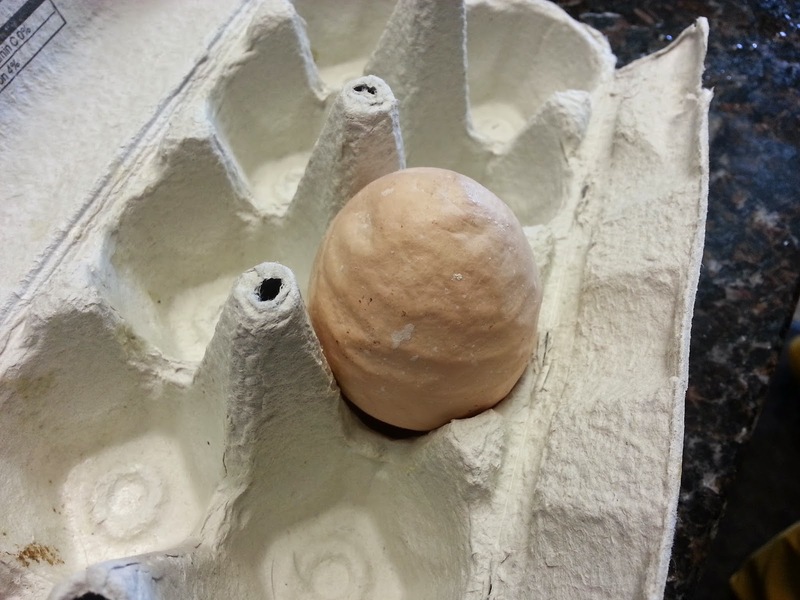 I found this large, misshapen egg in the nesting box this weekend. I found a large, misshapen egg. It was lumpy, the shell was thick and thin and looked nothing like what the hen has been laying for the last three weeks. 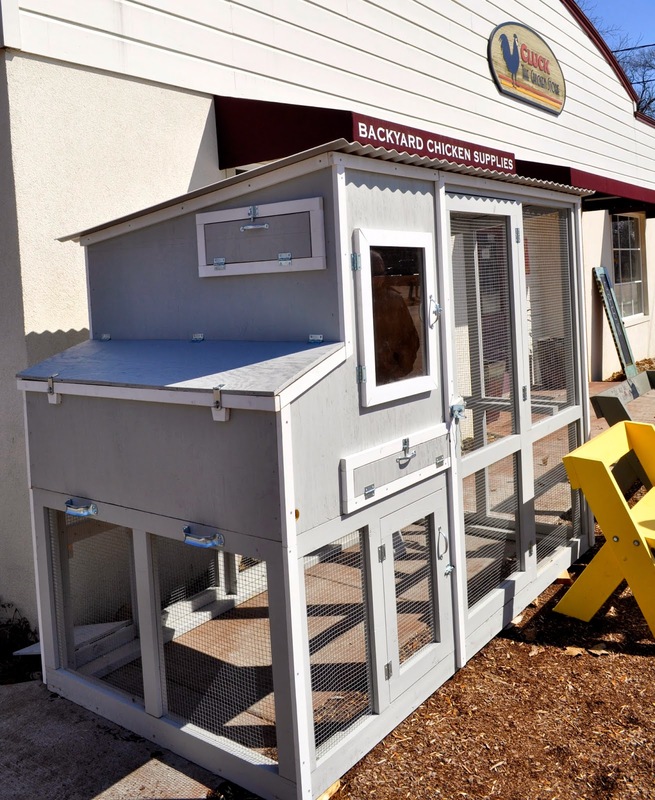 I checked out backyardchickens.com and found one article with photos of a very similar condition, but not much info. The concluding advice in the threaded discussion was "Was probably just a glitch in the hen's system. Nothing to worry about!" So, I broke the lumpy egg open and it smelled fine. So I cooked it up. What more mysteries to chickens have to offer, and how much more do I get to learn as I care for a new species of animal?